In the run-up to Christmas, the issue of homelessness in Britain briefly made headlines after a man sleeping rough in London collapsed and died in a stairwell in Westminster. Gyula Remes, who was 44, was the second homeless man to die within a stone’s throw of the Houses of Parliament in the last year. At the same time, the Office of National Statistics published figures showing that nearly 600 rough sleepers died last year – at an average age of 42 for men and 44 for women – and that the figure has risen 24% in the last five years. Rough sleeping has soared 169% since 2010, with 4,750 people now estimated to be sleeping on the streets on any one night. Yet Communities Secretary James Brokenshire was quick to deny any link to government policies, preferring to blame those favourite Tory scapegoats - drugs, migration and family breakdown. Shocking though the figures are, rough sleeping is only the visible tip of the homelessness crisis in Britain. According to the housing charity Shelter, at least 320,000 people were classed as homeless in 2018 – a rise of 4% on the previous year and equivalent to 36 new people becoming homeless each day. There are 1.2m households currently on council housing waiting lists, including over quarter of a million living in unsanitary or overcrowded temporary conditions; 130,000 children are currently housed in such accommodation, often a single B&B or hostel room – a rise of 59% on five years ago. Overall, statutory homelessness (a figure that hides thousands more who do not qualify under increasingly rigid council definitions) has increased 48% since 2010. According to Danny Dorling, writing in the London Review of Books (20 December 2018), one person in every 200 in England and Wales is homeless. In the Labour borough of Newham, the figure is one in 25; in Conservative-run Kensington and Chelsea, where the Grenfell Tower was sited, it is one in 29. This spiralling crisis is a direct result of government housing policies over the last 40 years, under both Conservative and Labour governments. It is exacerbated by welfare changes – most recently the impact of Universal Credit, the mass sell-off and demolition of council housing estates, the growing privatisation of the so-called ‘social housing’ sector and the free rein given to a deregulated private sector to seek ever-greater profits from housing. It is no wonder homelessness is growing, as housing of any kind becomes unaffordable for those on low-incomes – despite a rise in overcrowded housing shared between multiple households. The housing charity Shelter found that in the private rented sector, the poorest households spend an average of 67% of their income on rent, which is rarely covered in full by housing benefit, frozen since 2010. In any case, four in ten private landlords surveyed say they operate an outright ban on those in receipt of housing benefit or Universal Credit. Even in social rented accommodation, DWP figures show that 47% of households are living in poverty once their housing costs have been paid. The housing charity Crisis says that homeless and low-income households are increasingly being squeezed out of not just the private rented sector but also of so-called social housing with a reported reluctance to let to those reliant on benefits and those with complex needs. 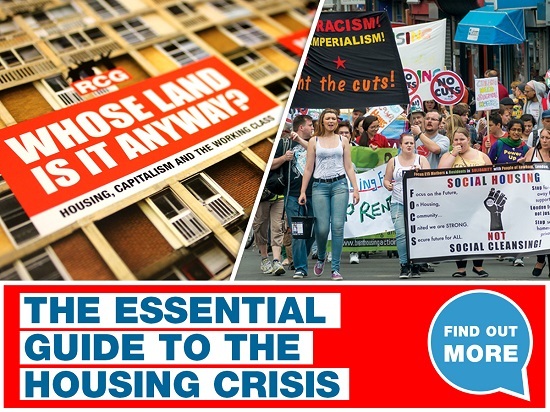 Faced with the scale of a crisis that no longer affects only the poorest sections of the working class but which has made decent housing unaffordable to those on average incomes across huge swathes of the country, charities, politicians and NGOs have been forced to address the issue. On 7 January 2019, a cross-party commission including former Labour leader Ed Miliband and the Conservative peer Sayeeda Warsi launched a new report by Shelter* that called for the building of more than three million units of ‘social housing’ over 20 years to tackle the crisis. The commission was set up after the fire at Grenfell Tower in 2017 forced the crisis in council housing onto the public agenda. Having spoken over the last year and a half to hundreds of social housing tenants, more than 30,000 members of the public and so-called housing experts, the report concluded with what anyone actually affected by the crisis could have told them years ago: only a mass programme of publicly-owned house building for general housing needs can solve the problem. The report was hailed as ‘ambitious’ and ‘breakthrough’ – but the problem lies not in identifying the problem, but in actually doing anything about it. While proposing a bigger public house-building programme than that carried out in the postwar period, like Labour’s Green Paper on housing before it (‘Castles in the air: Castles in the air: Labour’s social housing policy review’, May 2018 in reality Shelter’s proposal would barely keep up with current demand. England alone faces a housing shortfall of four million homes. To meet the backlog and provide for future demand would require building 340,000 homes a year until 2031. (Heriot-Watt, 2018). But even its proposed 150,000 units of council housing are not going to be built, though analysis carried out for the report by Capital Economics shows the economic benefits would ultimately outweigh the initial costs. Capital Economics estimates that up to two-thirds of the £10.7bn initial cost would be recouped through housing benefit savings and increased tax revenue each year, and that after 39 years the investment would have fully paid for itself. Such an analysis reiterates the important point that council housing is not ‘subsidised’, as its ideological opponents claim; it is affordable for the working class precisely because it does not have to make a profit. However, no capitalist government is going to invest in housing for the mass of the working class – and in particular its poorest and most vulnerable section – while it is experiencing its worst economic crisis since the 1930s and there are such vast profits to be made for investors, speculators and construction companies from the housing market, including in the so-called ‘social’ sector. An example of the kind of interests at play include the entry of US multimillion private equity giant Blackstone – the largest real estate manager in the world – into the lucrative social housing market in December. Blackstone aims to buy up ‘affordable’ rented properties, let them for a few years and then sell them on at profit. It is reported to be looking to buy public sector land on a ‘fairly large scale’. Other recent high-finance investors in ‘affordable’ social housing include the billionaire family owned William Pears Group – hoping to focus on snapping up council homes and retirement homes – CBRE Global Investors, UK property and investment giant British Land and the multinational financial services company Legal & General. The fight to wrest control of housing for the mass of the working class from these finance capital vultures will take more than fine words from charities and politicians. It will take a sustained struggle by the working class to demand housing as a basic human right.